As primary point of care field paramedics, we have been taxed with the new challenge of diagnosing 12 lead cardiographs in the field and making a definitive diagnosis of acute myocardial infarction. This overwhelming task has been at sometimes difficult to manage and to complicate matters, we do not use this skill regularly enough to maintain the skills. All cells membranes in the body are charged. Always be sure to check for an inverted or negative QRS complex in AVR. This will ensure that the lead were correctly connected appropriately and your recordings should be accurate. Analyse and evaluate the right chest leads. V1 & V2 will reveal more than any other two contiguous leads. This is where you check for a Bundle Branch Block, Anterior and Posterior wall infarctions, and "R" wave progression, etc.. When checking your axis, always focus on Leads I & AVF. Be sure to check for Bundle Branch Block. Axis vectors are inaccurate in their presence. When checking for signs of infarct, omit AVR. It is of no diagnostic value due to the fact that it misrepresents pathological Q waves and obscures them. Acute Myocardial Infarction cannot be positively identified in the presence of LBBB!!! It is prudent to suspect it per the patients presentation: however, serum enzyme tests among other things are needed to make the diagnosis. As a rule, standard criteria for diagnosing AMI dictates that ST elevation of 1 mm. or more in the presence of pathological Q waves in 2 or more contiguous leads is sufficient. Lead I: The positive lead is above the left breast or on the left arm and the negative lead is on the right arm. Records the difference of potential between the Left arm and Right arm. Lead II: The positive lead is on the left abdomen or left thigh and the negative lead is also on the right arm. Records the difference of potential between the left leg and the right arm. Lead III: The positive lead is also on the left abdomen or left lower lateral leg but the negative lead is on the left arm. Leads I, II & III & AVR, AVL, and AVF. The upper extremities need placement of the electrodes on the area of the lateral humoral aspect of the arms. The lower extremities need placement of the electrodes on the lateral lower legs near the lateral mallelous. Lead aVR faces the heart from the right shoulder and is oriented to the cavity of the heart. Lead aVL faces the heart from the left shoulder and is oriented to the Left Ventricle. Lead aVF face the heart from the left hip and is oriented to the inferior surface of the Left Ventricle. Records potential in the horizontal plane. Each lead is positive. The major forces of depolarization move from right to left. V1 and V2 are negative deflections. V3, V4, V5 and V6 become more positive ( peak positive is V3 or V4 ). V1 - fourth intercostal, right sternal border. V2 - fourth intercostal, left sternal border. V3 - equal distance between V2 and V4. V4 - fifth intercostal, left mid clavicular line. V5 - anterior axillary line, same level with V4. V6 - mid axillary line, same level with V4 and V5. The precordial views make up a cross section view of the heart in a transverse horizontal plane projecting a view across the AV Node. Einthoven's Triangle and the four limb leads make up the "HEXAXIAL VIEW!" This view is a vertical/frontal-posterior - ventral/dorsal plane making a star with 6 points intersecting through the heart in a flat frontal plane across the patients chest. The PRECORDIAL views are used to make up the other six views of the heart for a total of twelve views. So, adding this up: lead I, II and III, lead AVR, AVL, AVF, and the 6 precordial leads equals 12 leads... RIGHT????? Correct, however, we only need 10 electrodes placed. The following situation constitutes activation of the cardiac response team at the hospital by reporting the field diagnosis of AMI! Category one: AMI that clearly meets the criteria. Reciprocal changes not necessary to make the diagnosis. Category two: The following will result in your reporting the specific findings of concern that may or may not result in the Cardiac Response team. Injury/Infarct pattern in the presence of LBBB with cardiogenic clinical presentation. The following situation will result in the 12 Lead ECG being reported as "normal". No subsequent activation of the cardiac response team. Category Three: No patterns of ischemia or infarction. Tachycardia: (heart rate above 100) indicates damage to the left Ventricle and an "anterior" or "lateral" infarct. The Left Circumflex and or Left Descending Coronary Artery is occluded. Visable elevation in the CHEST LEADS: V-3, 4, 5, & 6. Bradycardia: (heart rate below 60) indicates damage to the Right Ventricle and an "inferior" or "posterior" infarct. The Right Coronary Artery is occluded. Elevation in the LIMB LEADS: II, III, & AFV. Assure that aVR is primarily negative. Rule out a :eft Bundle Branch Block (LBBB) in V1 and or V2... Verify in V6. Check all leads for patterns of ischemia, injury, infarction and reciprocal changes. AMI diagnosis criteria: 1mm. or more of ST elevation in 2 or more contiguous leads. Diagrams below indicate which part the heart is being affected and what lead would show the changes. Electricity always flows from positive to negative. The electrical current should flow from negative to positive in the normal healthy heart. So, if this pattern is disrupted by a "detour" or as in the heart, "an infarct" or "injury" the ECG recording will indicate the abnormal flow of current. With an infarcted heart, the electrical current flows opposite of where it is expected to flow. Hence, the elevated or depressed ST segment . For instance, an inferior infarction will show an elevation in lead II, III and aVF. The normal flow would be "isoelectrical" and the ST segment would be equalized or level. But, since the flow is going backwards around the damaged heart muscle, we see an elevation on the record. It is this precise measurement that can dictate exactly where the infarct is located. If the ST segment is elevated in V2, V3 and V4, the infarct is anterior. These views are looking at the front or anterior area of the heart muscle. The current is flowing toward the positive electrode on the patients chest. When the current is disrupted, it will show as an elevation in the ST segment versus an isoelectric reading. Think of it like this: An X-ray film is placed behind the heart at the area between the Ventricle Septum. The X-Ray machine shoots the picture from the anterior heart directly above the film. and the film captures the image. We would be looking at the area of the heart at the Septal region which would be in ECG terminology V3. 12 lead ECG; a real time video recording of the hearts electrical function. This record indicates a "septal / anterior Infarct." There is at least one lead with reciprocal changes..
Table below shows what the ECG would look like in the Vector where the heart is being affected. All other areas would look normal, without elevation or depression. unless there is an "old MI." In that case, the prior damage would show up as a depressed segment. If the Q wave ( the first downward "negative" deflected wave ) is more than 1/3 the size of the R wave ( the first upward deflected "positive" wave ) it is pathological and indicative of an A.M.I. If no R wave is recorded, then the infarct is extremely acute. There is no electrical activity of the ventricle during polarization and contraction. A LBBB pattern prior to the onset of clinical findings of AMI with marked reduction in voltage of the QRS complex may offer clues to the diagnosis of an infarction. LBBB obscures the pattern of AMI since the initial QRS vector is abnormally directed in a LBBB pattern. It will obscure the infarction vector and abnormal Q waves will not appear. The most diagnostic feature of AMI is the abnormal direction of the initial 0.04 sec of the QRS vector (ie; the abnormal Q wave). LBBB is usually associated with an Inferior wall AMI when an AMI is diagnosed. LBBB is usually associated with hypertensive ischemia or primary myocardial disease. The last 0.04 seconds of deflection on the QRS complex is used to determine the direction of the block. In V1 or MCL1, if the QRS duration is greater that 0.12 seconds (usually 0.14 - 0.20 seconds) and the last 0.04 second segment of the complex is pointing down (negative deflection), the block is LEFT. If the last 0.04 seconds of the QRS complex is pointing up and is positively deflected, the block is RIGHT. Certain easily identifiable ECG changes that are observed in the presence of cardiogenic chest pain, reveal some strong presumptive evidence toward the positive diagnosis of AMI. This pattern of changes is referred to as the "evolution of Myocardial Infarction." It is often suggested that the first observable evolutionary change is the ischemia we associate with T-wave inversion or ST segment depression. Then, onto what is referred as the hyperacute phase. In the hyperacute phase of the MI, (usually the first few minutes) the T-wave may simply increase in height, and/or the ST segment becomes elevated. The finale phase is the acute phase. In the acute phase, (usually the first hour or more) the ST segment elevation is accompanied by the development of a pathological Q wave. This Q-wave confirms the diagnosis of MI. This evolution is not precise, however. Often times the T-wave may invert in the presence of ST segment elevation during the end of the hyperacute phase. In any event... the most critical observation should be the recognition of ST elevation in 2 or contiguous leads. This is most important to paramedic in the pre-hospital phase because the development of the Q-wave may take hours and could easily be missed in the field. Eventually, the ST segment will return to its baseline and the T-wave resumes its normal position, leaving only the Q-wave as evidence that an infarction has occurred. Recent research and studies have produced 95% accuracy in field diagnosis by paramedics. Perhaps some reasons would include other indications for ST changes. They would include simple angina, drug effects, and electrolyte imbalance. Vector: A quantity of electrical force that has a known magnitude and direction. Axis: A hypothetical line which joins the poles of a lead which measure electrical force. Mean Cardiac Vector: The average of all the instantaneous vectors. ( AKA mean electrical axis ). For pre-hospital purposes, the axis is either "normal" or "not normal." The QRS deflection is upright or positive in I and either aVF or Lead II. A normal axis means the QRS axis falls between 30 and 90 degrees in the chest. The heart is lying in an angle between these parameters. The QRS is downward or negatively deflected in I and positive in aVF or Lead II. The heart is lying in an angle lower the 30 degrees in the chest. Can be normal in young adults or "thin people." May be abnormal in people who have a block in the posterior division of the left bundle. Can imply delayed activation of the right ventricle ( as seen in RBBB ) or Right Ventricular enlargement. Pathology: Right Ventricular enlargement and hypertrophy. C.O.P.D. Pulmonary Embolism, Congenital heart Disease, Inferior wall MI. The QRS is upright or positively deflection in I and negative in aVF or Lead II. The heart is lying in an angle greater than 90 degrees in the chest. Can be normal in the presence of acites, abdominal tumours, pregnancy or obesity. Abnormalities are due to Left Ventricular enlargement or a Left anterior hemiblock. Pathology: Left ventricular enlargement, and hypertrophy, Hypertension, Aortic Stenosis. Ischemic Heart Disease. Inferior wall MI. As stated above. the electrical current should flow to the positive lead. If it does not flow in a positive direction, the heart is pointing toward the upper right or the left. So, if the QRS is negative in aVF, the heart is pointing more to the left than normal; hence, Left Axis Deviation. If the QRS is negative in Lead I, the heart is pointing more to the right than normal; hence, Right Axis Deviation. This is very complicated and difficult to explain in this forum. If you need info on AXIS deviation or 12 lead diagnosis, please send E-Mail and information will be provided by E-Mail or conventional postage. By, Mitch Mendler E.M.T. paramedic, San Diego Paramedic. 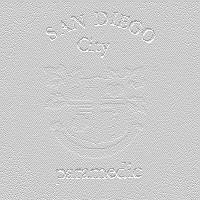 San Diego Paramedic Association field handbook. Click here to send E-Mail to The San Diego Medic Association. To contact Eric Yeargain send him E-Mail here. Click here to go back to the main page: The San Diego Medic Association. All aspects of this page are copyright � 1996 S.D.M.A. and unless otherwise stated are property of the San Diego Medic Association.